I've been feeling like I haven't been exercising as much due to the holidays but I also think it's because I started eating worse since Thanksgiving and the extra 5 pounds I'm carrying out is making it harder to push myself in WODs and even biking. I keep meaning to start eating better but then someone shows up with another delicious baked good or chocolate! It is slowly getting better though, I'm eating more mixed greens with grilled chicken or kabobs and now I just need to work on removing the sweets from my immediate space. Like I said, exercise has gotten harder! 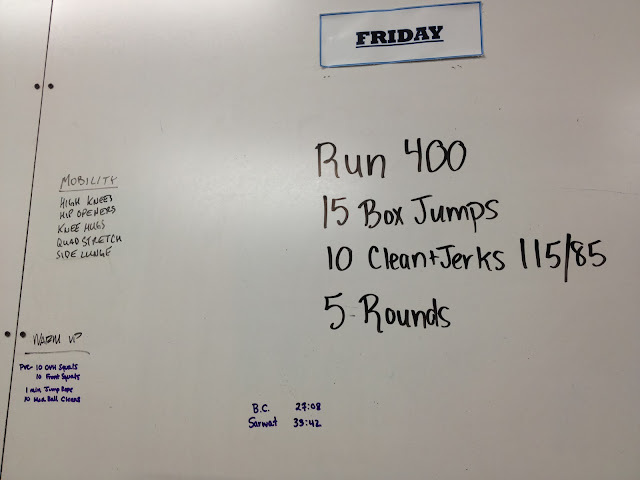 This was a really painful WOD for me. It felt like molasses running and doing full clean and jerks (squatting all the way down and getting back up to jerk the bar overhead) was hard. The only saving grace was that I was doing them with great form! Saturday, I volunteered for some trail work at Briar Chapel. The Elevated Trail Design crew was out there and showed us what we needed to do to get the trail ready for use. It was a lot of moving dirt and rocks, tamping the dirt down and raking. I was prepared to be out there for 4 hours but since we had so many people show up, it only took us 2.5 hours to finish the job! Trail building is still new to me but I feel like I learn something every time I'm out there. This time I learned how to look at the path and determine if the slope was going to cause water pooling/retention and how to re-grade the slope to allow water to drain. Fun times. 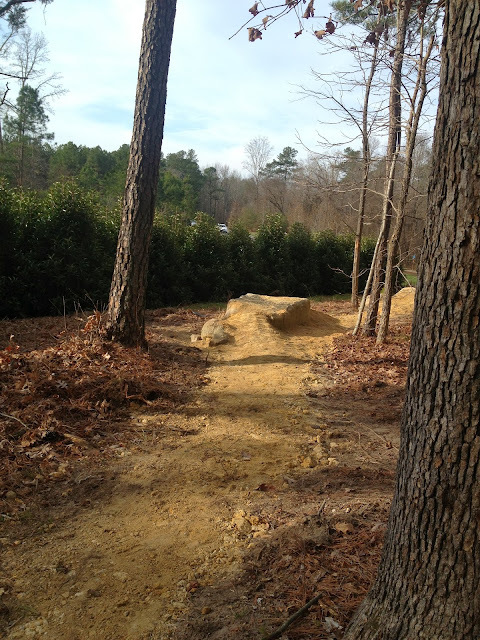 New trail at Briar Chapel! That was a lot of dirt moved and positioned just right. On Sunday I took the Blur out to test my lap time out at Crabtree. I ended up doing the outer loop in 35 minutes, 3 minutes faster than the Specialized Epic and Specialized Fate demos! To me this means that I'm still fast (enough) on my 26" wheels compared to a 29er and if I want to get faster, I'm going to have to improve on my bike handling skills before I can justify a fancy new bike. And I still love the Blue so I'm not ready to give it up yet! I ended up riding Crabtree for about ~12 miles or so and then went home. Crabtree is an easy trail but it was still a nice feeling to know that I'm not as slow as I think I am even in this current state of fitness. Now if I would only get back on my training plan to get faster! 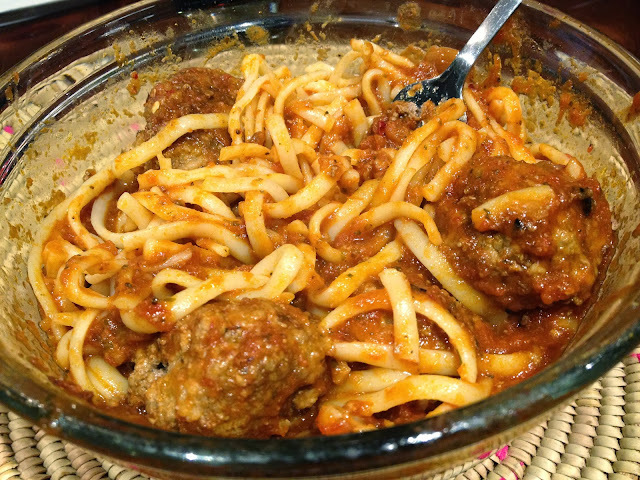 I went down a dark path and ate many meals of linguine with meatballs- too many leftovers! 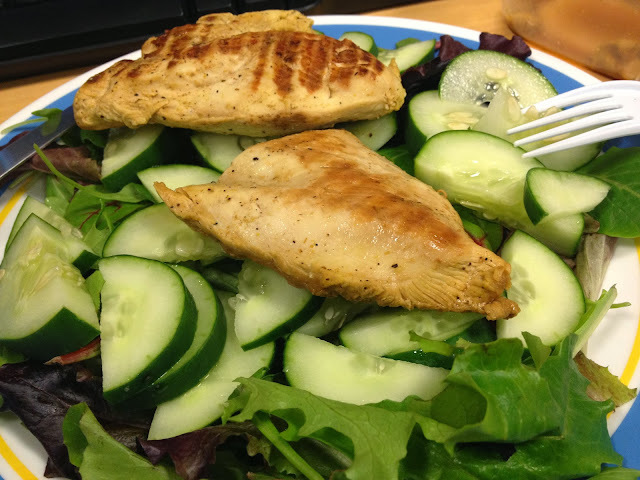 Back on the right path with greens and grilled chicken! Should have had some avocado in there too. The linguine and meatballs sound good; making me crave pasta!